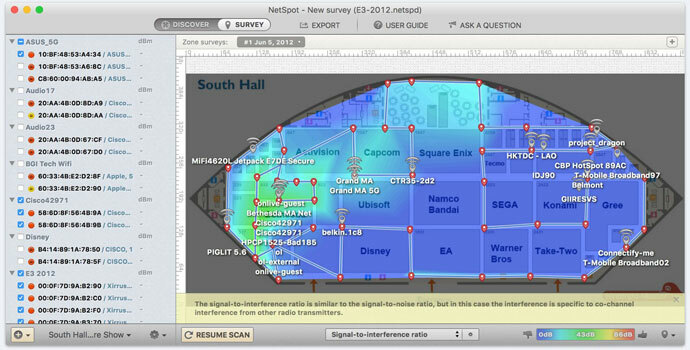 NetSpot is a great Wi-Fi site survey app for Mac (and Windows), which could be used to analyze and troubleshoot wireless networks. This review contains more information on this free Wi-Fi analyzer. The spot’s radio frequency behavior should be understood and a solid research is required in order to get an optimal coverage from a Wi-Fi network. A wireless site survey could help a lot in providing this information in an effective way. Using this tool, a solid network could be built, since dead zones and channel interference areas could be revealed by it for users. Lots of time, finding the best spots for network equipment such as antennas and cables, and access points is very crucial for building an optimal wireless network. This process could be done much easier using a WiFi site survey. In addition, Wi-Fi security analysis could benefit a lot from wireless site survey as well. False-positive intrusion alerts removal, cross-channel interference avoidance, unauthorized workstations detection and rogue access points locating and elimination are some of the security benefits offered by NetSpot. WiFi signal strength, non-broadcasting SSIDs and network security settings (e.g. WPA/WPA2 Personal/Enterprise, WEP, Open) could also be checked by NetSpot. In brief, users take advantage of NetSpot app to troubleshoot, manage and visualize their wireless networks. Additionally, it could be used to plan, deploy and audit these networks as well. In addition to mentioned options provided by the free NetSpot app, more features are offered by paid editions of the program. Cross-project imports: data (e.g. AP aliases, zones, etc.) could be transferred easily from one project to another. Easier APs management: renaming, alias lists import/export & custom aliases. Guess range customization: depending on the environment surveyed by users, guess range could be adjusted. Available presets include outdoor and indoor areas, office space, apartments and so on. Project auto saving: hitting Save is not necessary on every step since survey autosaving could be configured. Supporting hidden SSIDs: survey mode could be used to detect and scan hidden networks. Active and passive scanning: the free version includes the passive scanning whereas paid editions include both scanning types. Iperf3 and custom speed servers are supported. There are also speed tests for Internet upload and download. Survey data export: customizable advanced reports are provided in addition to multiple export options. Flexible APs grouping: grouping could be done by security, vendor, channel, SSID, etc. Also, custom groups are supported as well. There is also a Windows version available as well for users with Microsoft powered systems. Please note that the free version of the software comes with some limitations. The most important one is the number of zones per project which is only ‘one’ for free users. Other limitations include: no export discover mode, limited survey mode and 50 data points (versus unlimited in ‘Pro’ and ‘Enterprise’ editions) per heatmap. Business users could buy the license for ‘Pro’ edition for $149. This edition is for 1 Mac and 1 user. Network experts might find the expanded options and features of the ‘Enterprise’ edition more suitable for their needs. Selling at $499, ‘Enterprise’ plan could be used on 10 Macs by 10 users and features unlimited zones. More Pro/Enterprise features could be found above or on the NetSpot website.